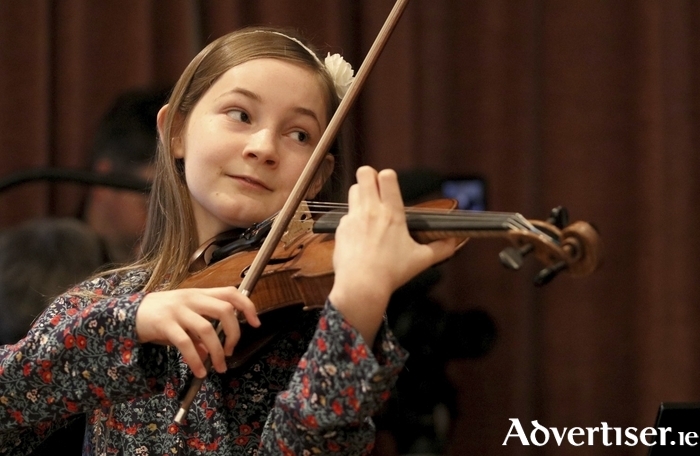 PRODIGY, THIS year’s Music for Galway midwinter festival, will feature amazing music by brilliant prodigies from history like Mozart, Mendelssohn, Mahler, and Prokofiev, as well as present-day wunderkind Alma Deutscher, who will be making her Irish debut. The festival runs at the Town Hall Theatre from Friday January 20 to 22, and features soprano Ailish Tynan, pianist Christian Chamorel, the Conte3mpo and Esposito quartets, and the aforementioned Alma, an 11-year-old pianiast, violinnist, and composer. “One of the challenges and one of the joys of being artistic director of Music for Galway is that it is my job to come up with an interesting theme for the midwinter festival,” Finghin Collins tells me as he explains the inspiration behind this year’s programme. “Rather than just having something like a Beethoven or Schubert festival, I think it is nice to have a more specific theme that links music from different periods together and I thought prodigies would make a lovely showcase for a weekend. "Once you walk in the door of the Town Hall on Friday night you’ll know that every single note you will hear performed will have been composed by a teenage composer, and some pieces were even written in pre-teenage years. For many years I have been astonished by the output of many of the more precocious composers. I have performed some of the works; for example there is a song by Schubert, ‘Gretchen am Spinnrade’, which is being done and it is such a mature work. It’s a short song but it has incredible intensity and maturity and I always find it absolutely astonishing that he was only 16 when he wrote it. While many of the featured composers started penning music while very young, Collins admits it was usually when they hit their teens that their compositions began to acquire real depth; “When they hit 13 or 14, the music develops and at 16 it definitely gets more substantial, but it is extraordinary what they were doing when you think back to our teens and being spotty adolescents. One much-feted pre-teen who is a headline attraction at the festival is English prodigy Alma Deutscher. Just 11 years old, she is a gifted pianist and violinist who has performed around the world. She composed her first piano sonata aged six and her first full-length opera, Cinderella, was premiered in Vienna last month. Conductor Zubin Mehta recently described Alma as "one of the greatest musical talents of today". Alma will give her Irish debut as she opens the festival on Friday night and in the Spotlight on Alma concert on Saturday at 2pm where she will be joined by soprano Anna Devin, Finghin Collins, and members of the Contempo Quartet, to perform a selection of her compositions. She will also perform early works by Beethoven and Clara Schumann. An intimate insight into the life of a child prodigy is afforded by Alan Yentob’s BBC film Imagine…Do or Die: the Lang Lang Story which will be screened on Sunday at 11am, an event for which admission is free. Collins goes on to talk about the performers he has assembled for the weekend; “We have two great string quartets because I particularly wanted to feature the Mendelssohn octet because it is an absolutely captivating piece. It’s a big work with four movements and I wanted to finish with that, so we needed two string quartets and we have Contempo, who are well known to us all in Galway. "Another Irish-based quartet, the Espositos, who are made up of members from different Irish orchestras. They will be performing on the Sunday and together with the Contempo to finish on the Mendelssohn. Contempo are also taking on works by Glazunov and Arriaga which will be less known but are again by extraordinary, prodigious composers.